Near Vulture Peak, western Maricopa County, Arizona, USA. Aug. 21, 2016. Length is about 8 mm or about 1/3 of an inch. 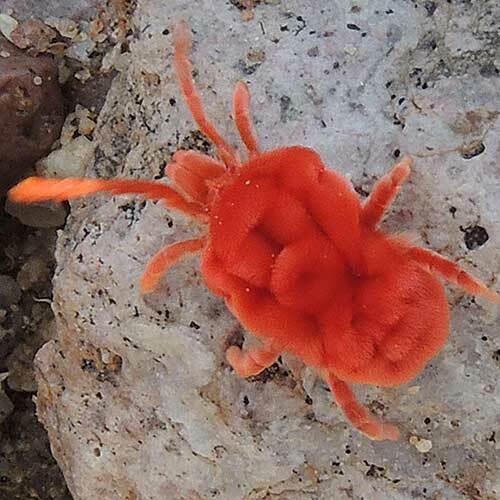 These bright red mites come to the surface in the desert for only a few days of the year, usually right after a good heavy summer monsoon rainstorm. Their life beneath the surface for the rest of the year is a bit of a mystery. Add to that their improbable color and texture and it is understandable that they capture the attention of hikers. They are often described as a Fuzzy Red Spider. The adult mites like the one shown feed on the eggs of insects, whereas the immature larval forms are parasitic on an insect found in the soil such as a beetle grub.